With a solid cast, strong writing and direction and excellent production value this is ten hours worthy of your time. It was called the "Trial of the Century" and it had the American public captivated for almost 10 months. Orenthal James (O.J.) Simpson (Cuba Gooding, Jr.; Selma) was arrested and formally charged with the murders of his ex-wife Nicole Brown Simpson and restaurant worker Ronald Goldman. Captured in a 10-hour limited television series, American Crime Story: The People vs. O.J. Simpson chronicles the details and emotions of this gripping event and subsequent acquittal. Simpson had a volatile relationship with his ex-wife, Nicole. He had previously been charged with domestic violence after he beat her. When she was discovered murdered in the early morning of June 13, 1994, police went to Simpson's home to inform him of the events. Even though he wasn't home, they found what they believed was evidence which could implicate him in the murders. After an emotional few days, Simpson fled from police in the now infamous White Bronco car chase down the Los Angeles Freeway that culminated at Simpsons home, where he eventually turned himself in to stand trial. The trial began on January 24, 1995 and immediately divided a nation. While many believed he was guilty, others felt, thanks to his defense team, that the evidence was planted in a racially motivated move. Based on the Jeffrey Toobin novel The Run of His Life: The People vs. O.J. Simpson, the 10 episode television event aired weekly on FX from February 2, 2016 through March 15, 2016. Featuring an all-star cast, the show garnered critical acclaim and 22 Emmy Nominations. The story gave an inside look at both sides of the trial and offered a human and emotional component to the media circle that surrounded the trial. Besides Gooding, Jr. as a very believable Simpson, the show included Sarah Paulson (American Horror Story) as Prosecutor Marcia Clark, John Travolta (Pulp Fiction) as Attorney Robert Shapiro and David Schwimmer (Friends) as Simpson's friend Robert Kardashian. Nathan Lane (The Good Wife) and Courtney B. Vance (State of Affairs) add even more drama as F. Lee Bailey and Johnnie Cochran respectively. For the most part, the acting is good, if not overdone sometimes, and it was difficult to see Schwimmer as anyone other than Ross from Friends. Compelling and insightful, American Crime Story: The People vs. O.J. Simpson is a masterful example of well-done television. The script give moves along at a good pace and episodes break at an appropriate time. The cast all give outstanding performances and bring the words to life. The set designs and costumes help to cement the mood and time period beautifully. The Blu-ray is presented in 1080p High Definition video with a stunning array of colors, though, at times, the black hues seemed to have a mix of green invading the color purity. The DST-HD Master 5.1 Audio is excellent and the dialog is clear and precise. Disc three offers two extra features. The first, Past Imperfect: Trial of the Century, is a 29-minute review of the cast and crew's reflections on the events of 1994-1995. The second, Facts of the case: an Interactive Timeline allows the viewer to use scenes from the show to retrace the timeline of the murders, arrest and trial. While an interesting concept, I found the latter feature to be a little confusing and not very user friendly. It's important to note the Blu-ray packaging comes with a velcro front that when opened reveals a written timeline of the events. This limited series is possibly the first of several the creators plan to produce and if the quality remains this high, the results will be worthwhile. With a solid cast, strong writing, direction and excellent production, value this is ten hours worthy of your time. Download The People v. O.J. Simpson: American Crime Story from the iTunes Store in Digial HD. For more information about The People v. O.J. 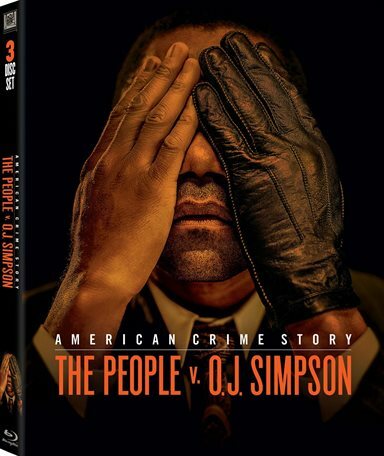 Simpson: American Crime Story visit the FlickDirect Movie Database.